↑ "I've been wanting to play Bhagat Singh: Karam Rajpal". Retrieved 27 May 2018. ↑ "New film tells 'real' Bhagat Singh story". Hindustan Times. 13 July 2008. Archived from the original on 1 April 2012. Retrieved 29 October 2011. 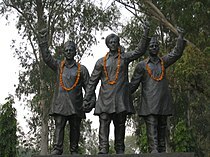 ↑ "Documentary on Bhagat Singh". The Hindu. 8 July 2008. Archived from the original on 1 April 2012. Retrieved 28 October 2011. ↑ Lal, Chaman (26 January 2012). "Partitions within". The Hindu. Archived from the original on 1 April 2012. Retrieved 30 January 2012. ↑ Ray, Shreya (20 January 2012). "The lost son of Lahore". Live Mint. Archived from the original on 1 April 2012. Retrieved 30 January 2012. 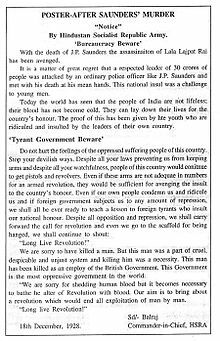 ↑ "Sanawar students dramatise Bhagat Singh's life". Day and Night News. n.d. Archived from the original on 1 April 2012. Retrieved 30 January 2012. ↑ Bali, Yogendra (August 2000). "The role of poets in freedom struggle". Press Information Bureau. ਭਾਰਤ ਸਰਕਾਰ. Archived from the original on 1 April 2012. Retrieved 4 December 2011. ↑ "A non-stop show ...". The Hindu. 3 June 2002. Archived from the original on 1 April 2012. Retrieved 28 October 2011. 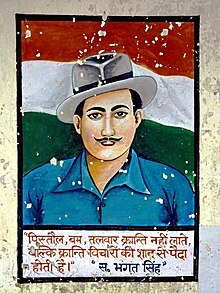 ↑ "Bhagat Singh and followers". Indian Post. Archived from the original on 1 April 2012. Retrieved 20 November 2011. 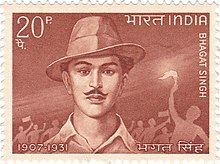 ↑ "Issue of coins to commemorate the occasion of "Shahid Bhagat Singh Birth Centenary"". rbi.org.in. Reserve Bank of India. Archived from the original on 1 October 2015. Retrieved 1 October 2015.